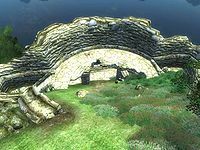 Fort Irony is a small fort southeast of Bravil containing goblins (quest-related). It contains only one zone, Fort Irony. The Forlorn Watchman: Lay to rest the spirit of a former sailor. Late at night, the Forlorn Watchman makes his way to Fort Irony, seeking the view it affords, east across the bay to the site of his death. 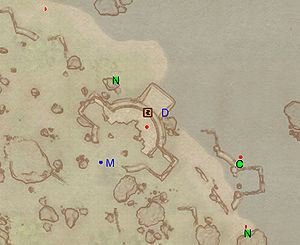 This location's map marker (M on map) is named Fort Irony (editor name FortIronyMapMarker). The entrance door is NE of the marker, 90 feet away. 1 Chest at the bottom of a submerged wall (contains gems and two potions; non-respawning) is at C. Two skeletons are on either side of the wall; one next to the chest, one closer to the fort. After a long corridor from the entrance, in the first room you will find two leveled enemies (likely goblins) and a minor loot chest surrounded by a large quantity of bones. 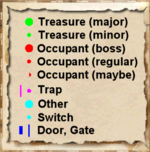 In the southeastern corner of the next corridor is a minor loot chest: step around the pressure plate at D to avoid the Swinging Mace trap at C. At the next junction you can head either left or right. The choice is immaterial as the fort is a loop. 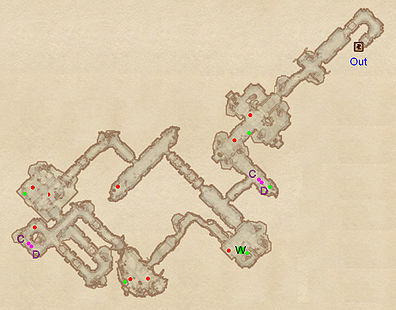 Heading to the left leads to a room where a leveled enemy guards a Shadowbanish Wine chest (W) and a minor loot chest. A skewered rat containing three portions of rat meat is crackling over the fire and another scattering of bones around it suggests the goblins have a healthy appetite. Head through the hole in wall into a cave section - the next room contains two enemies and a minor loot chest. A winding series of corridors lead you back into the fort and eventually to a room with up to two enemies and a minor loot chest. On the way, you will encounter an enemy next to another pressure plate - swinging mace combination (C and D). Complete the loop by heading northeast and dispatching the final enemy, before heading outside. This page was last modified on 27 October 2018, at 12:18.